What the carbon diet metaphor gets wrong about climate change. Dealing with climate change is not like trying to lose weight. Most of the world does not need a carbon diet. Photo illustration by Lisa Larson-Walker. Photos by Thinkstock, courtesy of NASA. Of all the crummy metaphors for dealing with climate change, the “carbon diet” is the worst—not just because it’s a moralizing cliché but because its priorities are all wrong. The Carbon Diet first showed up in 2000 as a scheme to get the citizens of Portland, Oregon, excited about reducing their carbon footprints—by changing bulbs, running dishwasher cycles differently, riding a bike. It was lightheartedly based on Weight Watchers. Portlanders liked the idea, but it didn’t really take off until after Hurricane Katrina, when David Gershon sat down and wrote a workbook called Low Carbon Diet: A 30 Day Program to Lose 5,000 Pounds. Al Gore liked it, and so did everyone else. In short order, the low-carbon diet became more than just a household strategy; it became the whole meme. Then-Gov. Arnold Schwarzenegger brought it up in 2006 when he announced that California was going to enact legislation to reduce greenhouse gas emissions. Trying to reassure the state’s business community that he wasn’t suggesting a revolution, he compared the world’s environment to an overweight person. Sticking with an unhealthy diet will lead to an early death, but “if you develop the willpower, and if you want to make some sacrifices and you want to listen to the experts, and change your eating habit and exercise every day, then you can have a long and healthy life,” he promised. See how the carbon diet meme works? If we make minor changes to our lifestyles, using morally correct willpower, we and the planet will avoid early death. Even when people aren’t directly invoking the carbon diet in their language, they often echo its principles by suggesting that everyone needs to cut back. But it falls apart—and starts to seem downright sinister—when you look at its priorities. Most of the world does not need a carbon diet. Three-quarters of the global population uses just 10 percent of the world’s energy, 1 billion people lack access to electricity, and 3 billion cook their food over dung, wood, and charcoal, leading to millions of early deaths. These people are energy starved—and they need a feast, not a diet. People in Angola, Bangladesh, and Cameroon, for example, use about 250 kilowatt-hours of electricity per year, while people in the U.S. use 12,246. The carbon diet is a miserable prescription for the world’s future because it contains no vision of a shared future and shared prosperity. Instead, it offers a default vision of a dog-eat-dog world where starving hordes will tank the planet. You can see it in that (actually excellent) article about pea protein powder burgers from Outside—“with the developing world lining up at the table and sharpening their steak knives, global protein consumption is expected to double by 2050.” It’s become commonplace to mourn the building of another coal plant in China as leading to our demise, but getting people off of wood, dung, and charcoal heat is actually a climate bonus. Anyway, these hungry hordes are not the cause of global warming: 52 percent of carbon that’s ended up in the atmosphere since 1850 has been from the U.S. and the EU, and only 11 percent is from China. What we need is a more optimistic, inclusive, and realistic vision of the future: More of us will live in cities, use more energy, eat better food, be better educated, and be healthier. How will we accomplish this? We will need to change the focus of our innovation from reducing to expanding. We need to innovate toward more low-carbon energy sources, but we also need massive innovation to meet more needs with less power. A gut feeling for virtuous austerity is a lousy guide here. Consider air conditioning. The world uses a trillion kilowatt-hours of electricity for AC right now, and with urbanization, greater wealth, and warming, it’s projected that amount will increase tenfold by 2050, far outpacing zero-carbon electricity generation. The issue is not whether people in developing countries “should” have air conditioning—what virtue is there in dying in your apartment during a heat wave? It’s how to get it to them. AC is a crucial part of building the knowledge economy employment that will eventually bring down carbon emissions because it increases the productivity of people and computers. Without AC there would be no grand economies in Hong Kong, Atlanta, or Bangalore. Already, 40 percent of Mumbai’s electricity generation is used for AC—creating a massive strain on power grids on the hottest days. We’ll need to combine cooler architecture designs with better systems for chilling with less energy. For example, some systems chill water at night, when the grid is fairly robust and less carbon-intensive generation is running—then they use solar powered fans to spread the cool air at the hottest time of the day. We’ve had X Prizes for repeatable space flight and vehicles that get more than 100 miles per gallon. What we need is an X Prize for better AC. But we’ll never stumble upon a better, fairer future with the diet metaphor because it suggests that the means for change lie in individual willpower. Running the dishwasher differently and swapping out light bulbs is all well and good. But what use is it when you’re talking about a trillion kilowatt-hours a year, the design and finance of cities, power plants, and diversion of methane in landfills? 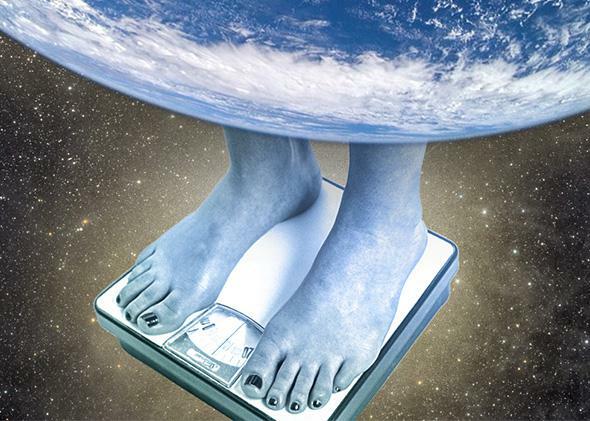 The carbon diet’s obsessive emphasis on personal tracking, virtue, trading, and consumer changes closely tracks the neoliberal agenda, by placing the locus of power on individuals, as pointed out by academics Matthew Paterson and Johannes Stripple. But in fact, only about 10 percent of the money currently being spent on climate is controlled by consumers, as you can see in this fascinating diagram of climate finance from the Climate Policy Initiative. And if we want to deliver enough electricity to make a difference, we need to strengthen states—the precise opposite of what the International Monetary Fund and other international institutions have been doing through neoliberal policies such as demanding structural adjustments (divesting of state property, charging for education and medical care) to debtor countries since the 1980s. The real issue with the carbon diet is that it suggests that we can deal with climate change as easily as we might switch to gluten-free pasta and beer, via willpower and careful substitution, when what we’ll really need is some kind of revolution in our thinking and technology. (It’s probably also worth mentioning that the reason diets are such an evergreen topic every January is because they don’t work in the long term.) We’ll need a mixture of big and little creative destructions, investments, and institutions to get us to a world where fewer people are suffering and climate change slows down and stops. But we won’t get them if we’re staring at our waistlines instead of thinking ambitiously.